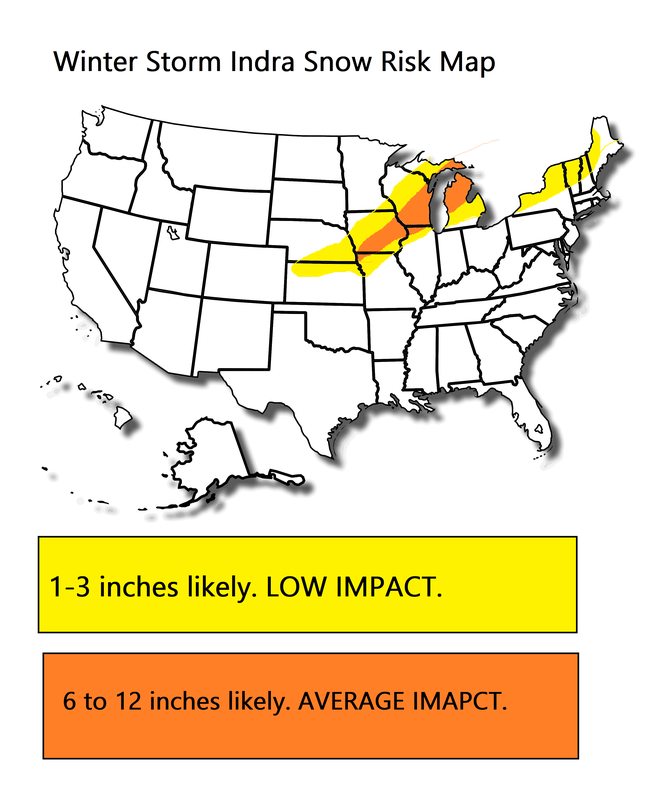 After a large swathe of blockbuster totals pounded the North East this past weekend, the next winter storm (named “Indra”) wont be packing the same punch as the previous winter storm “Harper”, it will still have it’s own dangers. The NWS has issued a Blizzard Warning, the highest level of winter warning issued from their department, for central north eastern parts of Colorado and the far NW of Kansas, as well as the southwestern most county of Nebraska. Blizzard conditions are imminent here with strong winds and high snowfall totals combining to bring extremely challenging or immobilizing travel conditions! Rates of over 1″ per hour are currently affecting these areas and will ease in the next 6 to 18 hours. Before shifting towards Iowa, southern Wisconsin and the lakes for tomorrow. Some, but not all! Remember you can access all of our updates (short and long range) via the homepage. You can also access some UK Weather Charts. Right then, it’s already a lot colder for 90% of the country away from the far SW of England & Ireland. Tonight will be a cold one with a patchy frost. Snow? 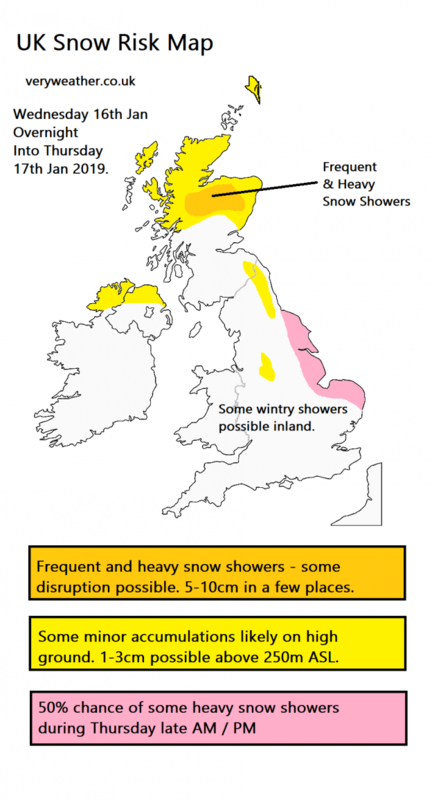 There’ll be significant snowfall for inland areas of Northern Scotland. Places like Aviemore, Braemar and parts of the A9 road could see 5-10cm possibly tonight. There’ll be sporadic showers in the North, especially around coasts, places like the north of Northern Ireland and northern England could see some showers tonight. But unlike northern Scotland the showers further south will be more of a wintry mix with rain, sleet and hail to lower levels and snow on hills. It’s possible that we could see a more organized area of rain, sleet and wet snow push through central and south eastern England early tomorrow morning giving some wet flakes of snow that’ll probably struggle to settle. 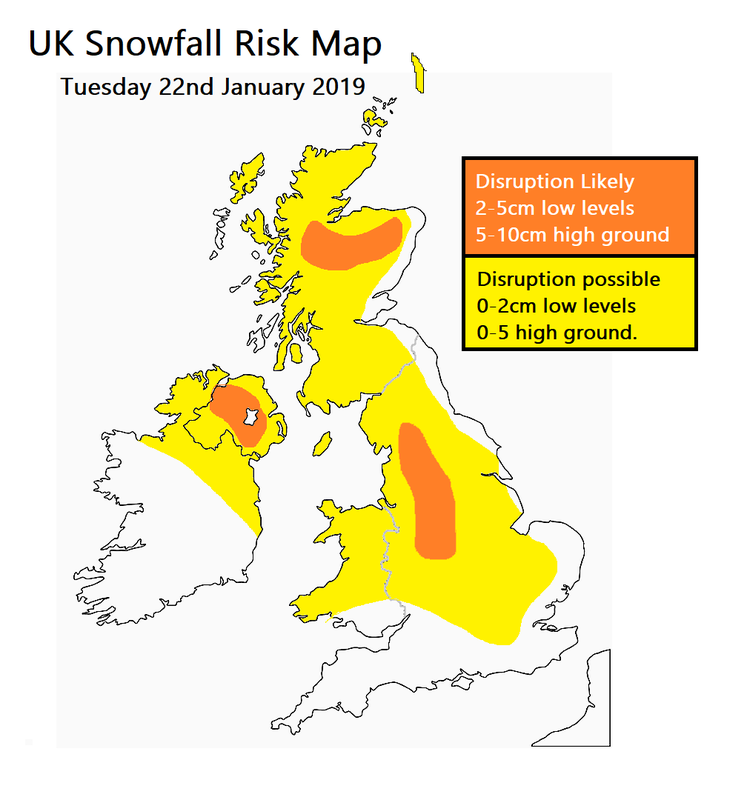 UK Snow Risk: tonight and tomorrow. So away from Scotland, any snow tonight will be “trivial” and wont really be disruptive. Ice may be more of an issue with the low temperatures. 0 to -2C in the countryside and +2 to -1 in towns and cities. Perhaps more significantly tomorrow will be sleet and snow showers running down North Sea facing coasts, in particular the coastal areas of east Yorkshire, eastern Lincolnshire, the Lincs. 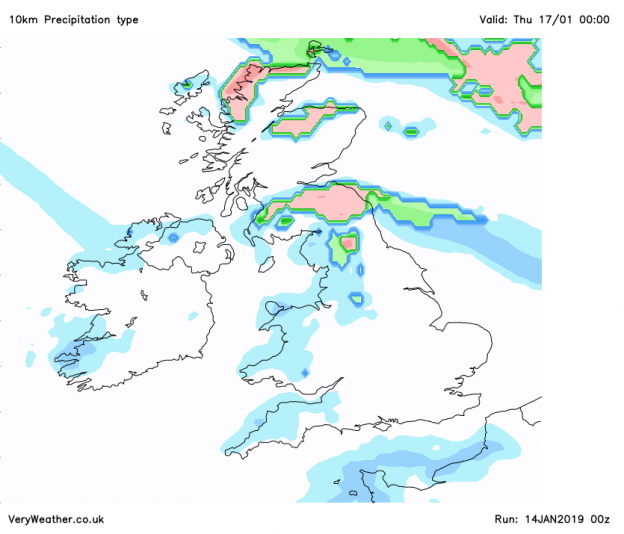 wolds and parts of Norfolk could actually see some significant snow showers tomorrow. 2-3cm could fall in a few places here. Elsewhere it looks largely dry tomorrow but quite a cold day with highs of just 2C in Scotland, 5C in the South. Friday and the weekend: Friday sees a very cold start with a widespread frost and icy patches in places. Rain however will spread into Ireland, South West England and Wales later in the day, and as it pushes inland towards the Midlands, parts of Northern England especially on the Pennines, we could see some snow. The forecast for Friday is causing a lot of headaches and uncertainties as various computer models handle the situation differently. So my advice is stay tuned to the forecast. There could be a few cm of snow for places like the Peak District, but this is far from a certainty. The weekend remains cold but probably becoming more gloomy and dank with some hill fog as opposed to the “clear and cold” weather tomorrow. Next week: likely to be cold, but how cold is the question. Next week will probably start off how this week left off. Cold. Feeling wintry to with a significant risk of snow for Northern Hills at first, but there’s a chance that more southern areas and to the south could see some of this later in the week, again this is quite uncertain and there’s a small chance things could become milder, however it is now increasingly likely that the UK will be affected by more “seasonable” weather with wintriness possible. This entry was posted in Uncategorized on January 16, 2019 by admin8. This is a major blizzard. Winter storm Harper (named) is currently providing over 25 million USA citizens with either a winter storm warning, watch or advisory with brutal snow, ice and blizzard conditions expected in the next 0 to 48 hours. 1.) PREPARE. It’s now looking very likely that interior portions of the North East will see blockbuster snowfall totals and combined with strong winds this major blizzard here will be immobilizing and life threatening. 2.) TAKE ACTION. Take action now to secure the safety of yourself and citizens around you, keep a close eye on NOAA warnings at weather.gov that remain functional during the govt. shutdown. 3.) Be Safe. Be safe during this weekend. This storm is a meteorological beauty (it is scientifically awseome), but life threatening. 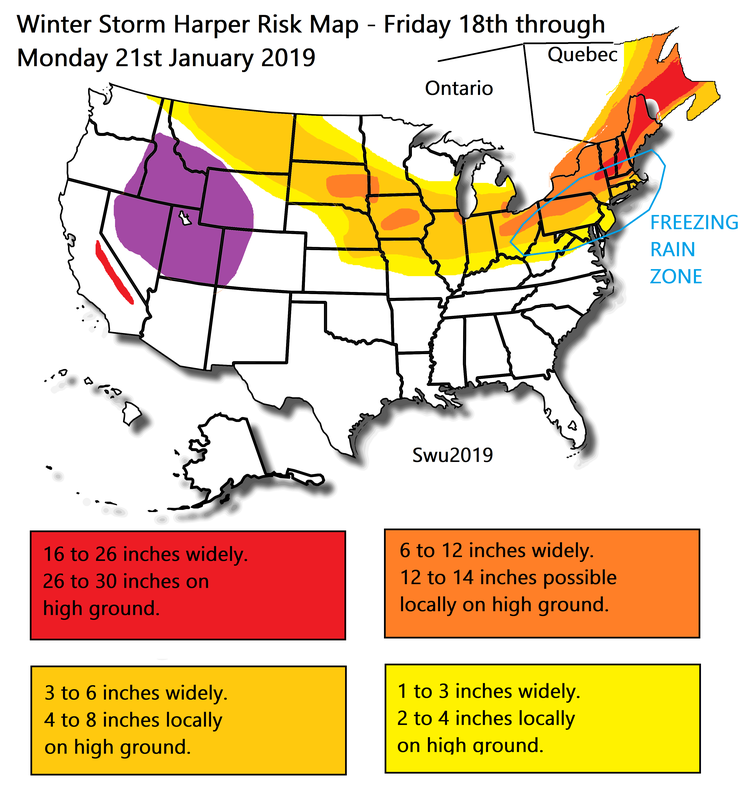 It has already brought several feet of snowfall to the mountains of California and is on a track eastwards and will score 75% of the Northern States with at least 1 inch of snowfall. The worst affected areas will be the upper North East. Parts of eastern New York State, into central Vermont, Central New Hampshire, Maine and into Newfoundland could see 2 to 4 feet of snowfall. Next up is a larger area scoping the north of Massachusetts, a larger portion of New York State inclusing the west, north and center of the state. The north of Pennsylvania, potentially places like the Chicago Metro locally due to enhancement of precipitation from lake Michigan, and eastern parts of South Dakota and potentially the south western part of Minnesota. Here lesser totals of at least 8 inches pretty widely are likely with more intense totals of 12 to 14 inches in some higher ground areas. Of course these are just rough figures, and the lines between heavy totals and light totals on the northern flank of the storm and between heavy snow, freezing rain and heavy rain on the south of the storm are very fine. In the red areas travel really will be impossible, the dark orange near impossible, the lighter orange “moderately challenging” and the yellow “a little challenging”. Of course with the risk of freezing rain for cities perhaps along the western flank of the I-95 corridor that may not see the highest totals (according to the current track of the storm), may be more significantly affected by this storm as an ice storm. Therefore I’d stay tuned to local forecasts to monitor any potential changes in this storm. A fairly insignificant change to the track of the storm by just 50-100 miles can change the conditions felt at the surface drastically for millions of people. Winds will be strong to so snow drifts will form in rural areas cutting off rural communities for potentially days and leading to travel misery. Freezing rain through Saturday & Sunday is likely for portions of the North East and aiding this storm in becoming a dangerous feature. Stay tuned to winter storm warnings etc at weather.gov. The first signs of a change are evident this week with temperatures falling in the north tomorrow before the cold air eventually seeps further south on Wednesday. There will be some wintry showers tomorrow, significant snowfall for parts of Northern Scotland with 5-10cm expected by Thursday on high ground via showers, with some light wintry showers draped around northern coasts, perhaps some flurries for the Pennines and Snowdonia to. To start Thursday most in land areas will be dry with a patchy frost, but early on there will still be some wintry showers of rain, sleet and light snow draped around some coastal areas. Thursday will be a colder than average day, the first of possibly quite a few, with highs of 3/4C for the Midlands, 6C on the South Coast and 1-3C for Scotland. Early Friday looks like a cold one, many central and eastern areas seeing a moderate frost with high humidity levels, temperatures down to -4C locally. 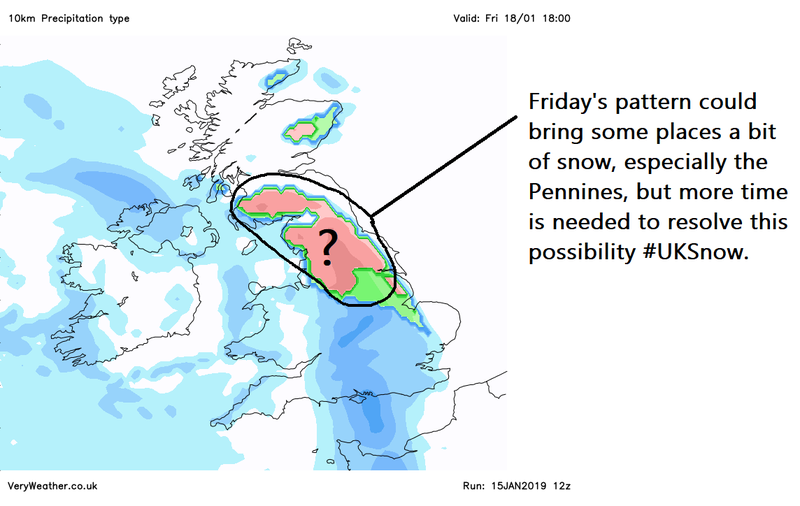 Although there is significant uncertainty, as a weather front progresses into the cold air on Friday there’s the potential for some snowfall. Exactly where and how much, and the exact timing remains uncertain and will be resolved by Thursday. However given that this event is now 3 or so days away there is increasing confidence that some areas will be affected by snow. 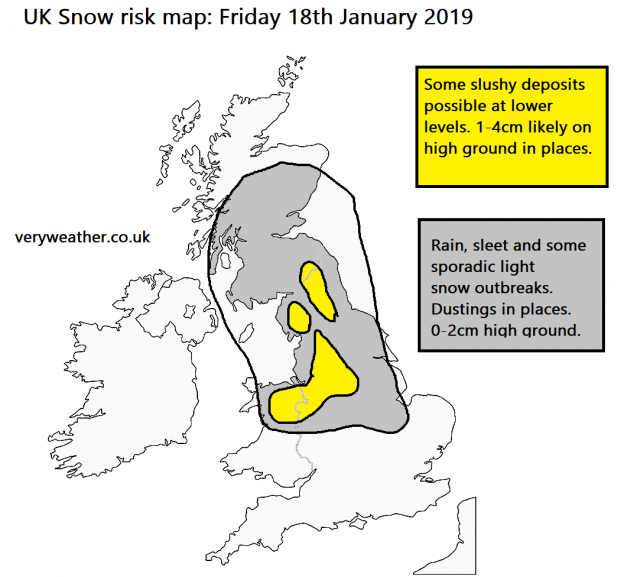 The most likely areas are parts of Northern England, Wales and the North Midlands, that’s not to say snow is forecast in these areas but the highest chances are these areas. Keep an eye on the forecast. There’s the prospect of something a little milder for the south west simultaneously, with temperatures rising to 6 to 8C in the south west perhaps. This looks like another chilly week. Temperatures are likely to be held below average thanks to a “blocked” pattern – meaning that the usual west to east flow across the North Atlantic is blocked and instead cold air is allowed to drain down from the Arctic. Uncertain as regards to how cold, there’s a low (20%) chance of very cold weather and easterly winds, with a 50% chance of generally cool-cold weather, and a 30% chance of average or milder than average temperatures; so the week look set up for cold as it stands. This entry was posted in Uncategorized on January 15, 2019 by admin8. Good morning – a really boring couple of days coming up weather wise (yet again!). Today (Monday) looks boring with just a few light showers in the north and west, drier in the south. It’s cold enough for some of those light showers to turn to snow above 200-300m in Northern Scotland but no where else. Skies clear for south eastern parts tonight and here we run the risk of a frost in rural areas to start Tuesday. A bit brighter here for tomorrow however further north we keep a rash of cloud and a few light showers dotted about but nothing major. Winds will begin to increase later on Tuesday heralding a change.. It turns increasingly unsettled from the north west by the early hours of Wednesday with lots of rain tracking south east. It’s likely most of us will pick up at least some moderate bursts of rain on Wednesday but once the cold front sweeps away (hopefully it will have done by tea time), it will turn drier into the evening for the mainland, but colder. Highs of “just” 5/6C (Scotland -50C) but I mean that’s only slightly below average… However, there will be a rash of wintry showers for the north west, Scotland parts of Ireland, hills of Wales and parts of the Pennines, scattered minor accumulations of snow on high ground areas in the north of 1-5cm above 300 metres for Scotland and even more scattered in the Pennines but there will be a touch for some. The below chart shows precipitation type forecast from the NMM model for midnight on Thursday (Wednesday night). There’s some support for a trough to enhance the precipitation activity in the far north during this time frame. This could bring a sprinkling of snow to places like Durham and Scotland, especially but perhaps not limited to higher ground. Pink indicates snow, blue rain. So a cold weekend either way, with a ridge of high pressure modelled to push in on Sunday / Monday. So there are differences between the GFS, ECM and UKMO with regards to the weekend’s disturbance, but all 3 have a fairly similar outcome for Sunday / Monday which is this ridge building in. So probably an enhanced risk of frost later on in the weekend and into Monday, but still some minor wintry potential which needs monitoring. There is good consensus for very disturbed weather later into next week, probably from Tuesday the 22nd on wards with a wrath of low pressure and the weather associated with it. However it would not be particularly mild, as the air with the low looks rather cold. 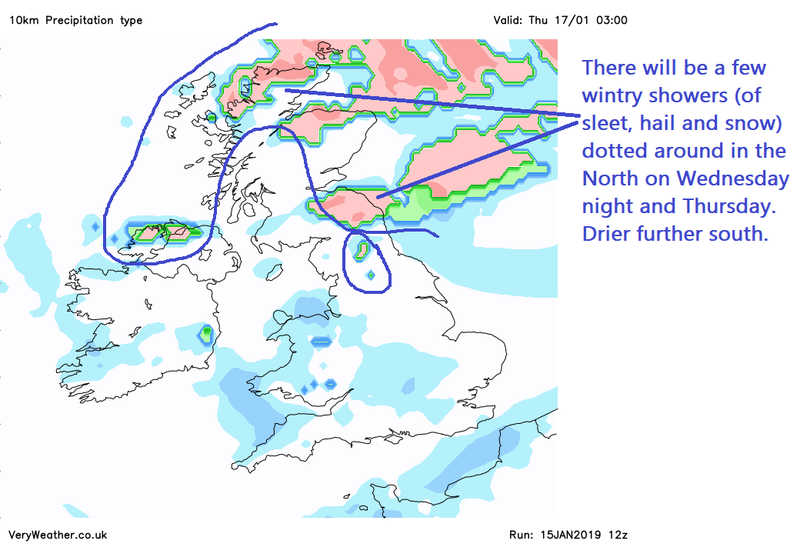 So central and northern areas have to watch out for wintry showers and snow showers maybe next week, watch out for the risk. And stay tuned to the forecast :D.
If you happen to scroll down this page and find snow warnings, they’re for the USA. This entry was posted in Uncategorized on January 14, 2019 by admin8.